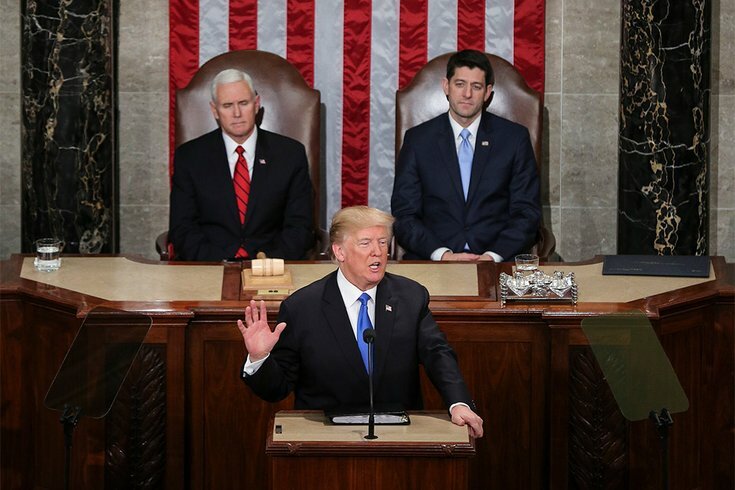 President Donald J. Trump delivers the State of the Union address as Vice President Mike Pence, left, and then-Speaker of the House Paul Ryan, right, look on in the chamber of the U.S. House of Representatives on January 30, 2018 in Washington, D.C.
Joshua Trump, an 11-year-old boy from Wilmington, Delaware, is growing up with the same last name as one of the most polarizing presidents in U.S. history, and his parents say that has made him a target for bullying at school. Now, as many speculate whether President Donald Trump will use Tuesday night's State of the Union address to declare a state of emergency and call for the building of a wall on the U.S.-Mexico border, the White House has confirmed that Joshua will be among he president's special guests in attendance at the U.S. Capitol. "Unfortunately, Joshua has been bullied in school due to his last name," the White House said in its guest announcement. Joshua, who is not related to the president, started getting bullied after Trump announced his candidacy in 2015, according to the Washington Post. "They curse at him, they call him an idiot, they call him stupid," Joshua's mother, Megan Trump, told 6ABC last year. After taking him out of school to be homeschooled for a year, Joshua enrolled at Talley Middle School in the Brandywine School District – but the bullying only continued. The school even went to such lengths as to keep his last name off the call sheet so teachers wouldn't call it out loud during class. 6ABC reported Joshua also changed his last name to Berto, after his father's last name, at school. The choice to invite Joshua comes as part of first lady Melania Trump's Be Best initiative, which is focused on combating bullying "in everyday life and on social media," even as her husband's Twitter feed seems to contradict that message. Trump enters tonight's State of the Union with the second-lowest approval rating of any president at this point in his tenure, at 40 percent. Only President Ronald Reagan approval rating of 35 percent was lower at the start of his third year in office. Joshua is one of 13 Americans invited by the Trumps as guests for tonight's speech. See the names of the others, including Holocaust survivor Judah Samet, here.